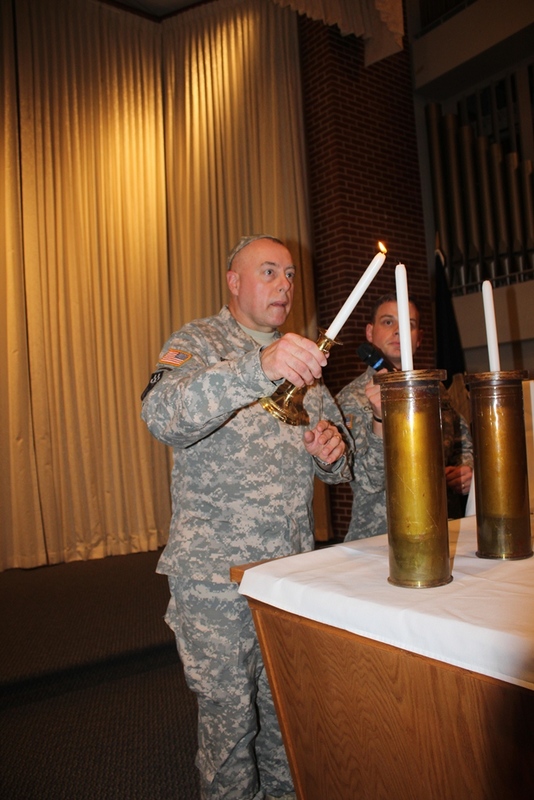 Jewish soldiers and community members at Fort Leonardwood, Missouri were able to participate in the first Chanukkah ceremony in recent history last week at Soldier Memorial Chapel. The ceremony was one of the first events led by Capt. Mendy Stern, chaplain, 94th Engineer Battalion chaplain, and the first rabbi assigned to Fort Leonard Wood since at least the 1950s. Around 60 people attended the ceremony, which included the lighting of indoor and outdoor menorahs, the singing of special Chanukkah songs, readings offered, and refreshments. Col. William Pfeffer, garrison commander, provided the keynote speech for the celebration. 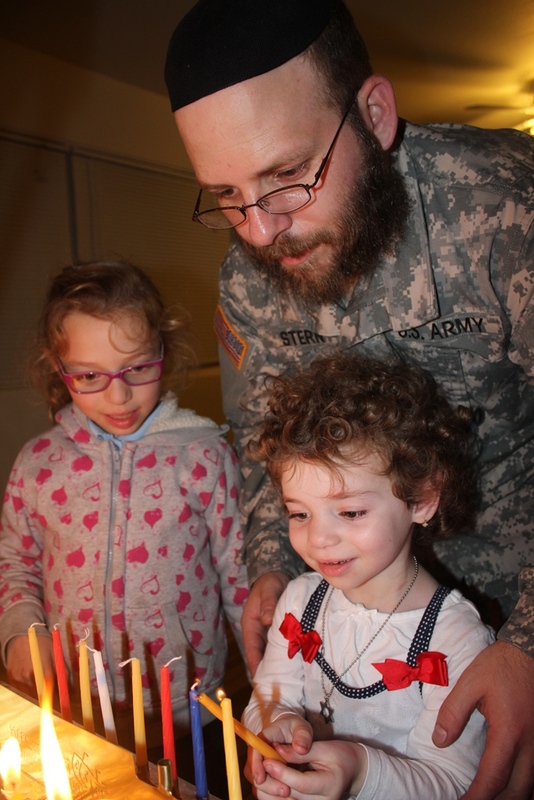 Now that the installation has a rabbi available, the Jewish community can expect to see more faith-based opportunities, such as the Chanukkah Ceremony, on Fort Leonard Wood. Stern said serving in the chaplain corps is a perfect fit for him. He said his upbringing had a lot do with his desire to serve. He has worked in numerous fields, including schools for troubled teens and did a lot of volunteer work before and after he was ordained as a rabbi in 2006. “When the opportunity to serve as an Army chaplain came up, it was a perfect fit,” Stern said. “Since I joined the military though I never looked back. I love my job, love the Army, love my Family — It is my honor to serve,” he said. Fort Leonard Wood has two types of Jewish communities, the permanent party and trainees. Currently, Stern is working to build the permanent party congregation on the installation. “We are in the formation phase, and it is open to anyone,” Stern said. “You don’t have to be a particular Jewish denomination to be welcome,” he said. With a rabbi, the Installation Chaplain’s office is able to provide Friday evening services 30 minutes after sundown each week at Specker Barracks Chapel. Stern said he welcomes the opportunity to advocate all Jewish soldiers and civilians on Fort Leonard Wood. Stern said now the installation has someone to bring awareness to Jewish holidays and host actual celebrations. He said now the Jewish community has someone to advocate for them and provide them with opportunities to practice their faith. He said before he arrived, if someone needed a Jewish funeral, etc. they would have to find a rabbi from Columbia, Mo. or St. Louis. Chap (Lt. Col.) Michael King, deputy installation chaplain, said having Stern on the installation is tremendous benefit to Fort Leonard Wood. “We have already seen a growth in the number of permanent party soldiers and families attending the Friday Sabbath meeting and many are choosing to meet on the Sabbath at the rabbi’s home for the Sabbath prayers and meeting,” King said. I am very excited about Stern and his family coming to Fort Leonard Wood. They are very nice people, easy to work with, and want to share their Jewish traditions and faith with anyone in the larger community who would like to take part,” he said.